I was staying at Hotel Elsa in the center of Skopje and walked to the stadium. Whichever Skopje hotel you choose, as long as it’s in the city center, it will be within walking distance of the stadium. 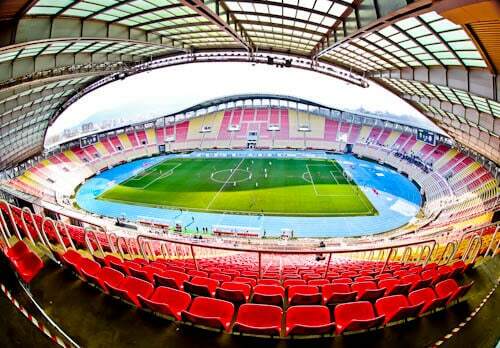 The Philip II Arena is located on the banks of the Vardar river just outside the center of Skopje. As a result you can walk along the river to the stadium which takes around 20 minutes. As you walk along the river you’ll pass several majestic buildings as well as the Skopje Fortress. The Philip II Arena is a UEFA Category 4 stadium. 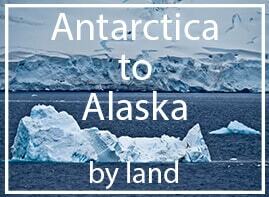 As a result it can host major European games. The biggest European game ever to be held here was the UEFA Super Cup final between Man Utd and Real Madrid in 2017. As you can imagine, the stadium was full to its maximum capacity of 34,460 spectators. 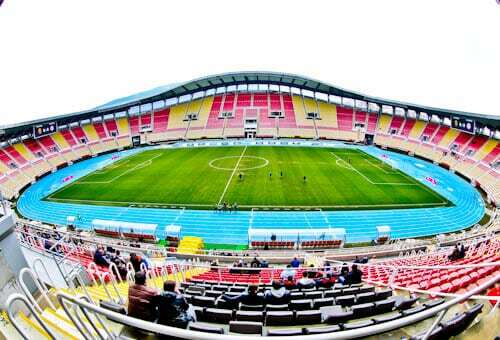 The stadium is home to the Macedonian first league teams of FK Vardar and FK Rabotnicki. Additionally, this is where the Macedonia home team play their home games. Music concerts are also held in the stadium and superstars Pink, Carlos Santana as well as David Guetta have performed here. The best seats in the house are the VIP seats. Not only do they have the best view but they are comfortable padded seats. 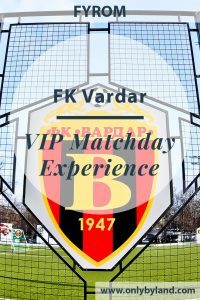 As match tickets are extremely cheap, I recommend you explore the VIP ticket option. Part of the excitement of the matchday experience is watching the players walk through the players tunnel and onto the pitch. This part is performed to the clubs anthem. 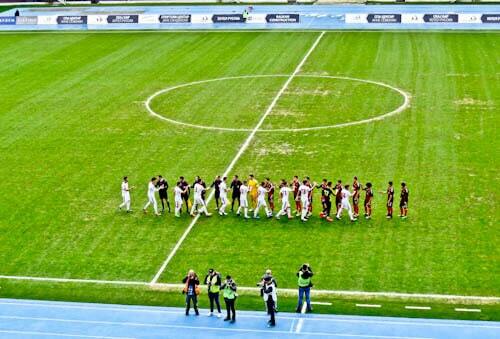 Shortly afterwards the teams will shake hands and the match will kick off. The Macedonian first league is far from the most popular league in Europe. 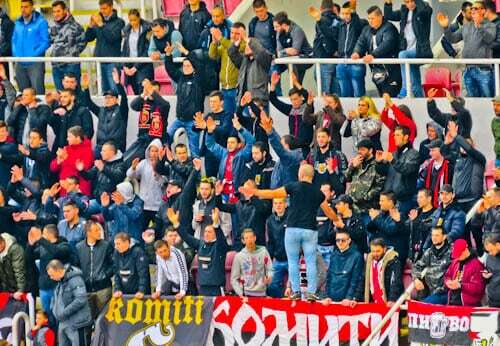 As a matter of fact, the Macedonians would rather watch Liverpool or Arsenal than watch their own league. For this reason, the huge Philip II Arena will likely be empty. Those fans that do turn up however, are very serious about supporting their team. It’s fun to watch them chant, shout, react to the game as well as play the drums! If for some reason, you are bored with the match, or maybe it’s half time, you can enjoy a city view. Simply walk to the top of the tier for the best views. 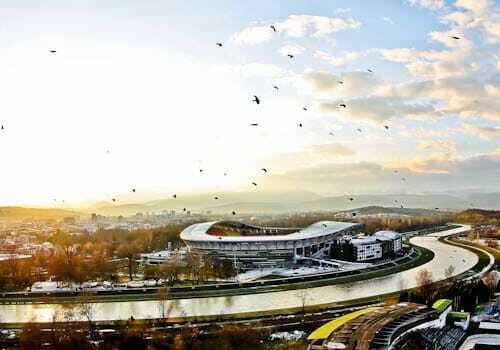 It’s possible to see some of the major landmarks of Skopje from the stadium. 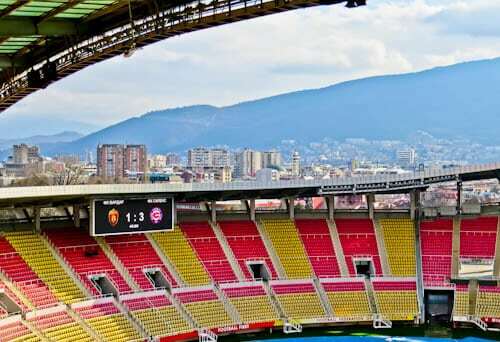 Furthermore, if you sit on the opposite side of the stadium, instead of a city view, there’s a Skopje Fortress view. As this is a Macedonian first league match, it will be televised. The media section is right behind the VIP section. If you wish to see the media at work, then this is another reason to choose a VIP seat. In fact when I ascended the stadium for a city view photo, I passed through the media section and was able to chat with a couple of the guys. They are very happy to see foreigners in the Philip II Arena! With today’s technology, the media can quickly edit and share their photos of the match. 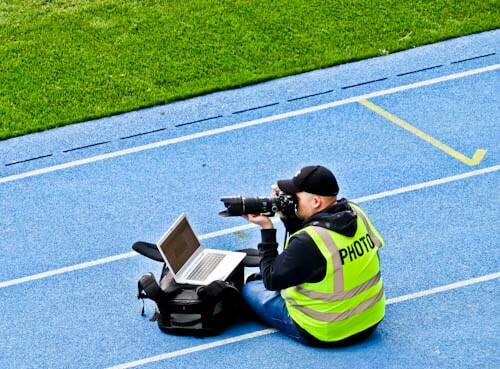 If anything interesting happens during the match, it’s likely you’ll see this guys photo of it first! I arrived at the stadium and all the shutters were closed. There’s was a match about to start and I could see supporters entering the stadium. Where do you buy tickets? If you arrive and the shutters are closed, this is excellent news because this means the tickets are free! I entered the stadium and went straight to the VIP section. If the shutters are open, then you must buy a ticket. Enjoy your visit to the Philip II Arena, the biggest stadium in Macedonia. Additionally, check out the VIP option, it will make a huge difference to your matchday experience. May the best team win! Check out the Athletic Bilbao VIP Matchday Experience, Spain. Things to do in Ohrid including Lake Ohrid and the wine region. 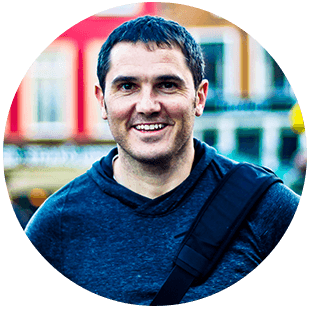 Things to do in Skopje.